This plastic strainer and stopper is a perfect replacement for any tub or sink. 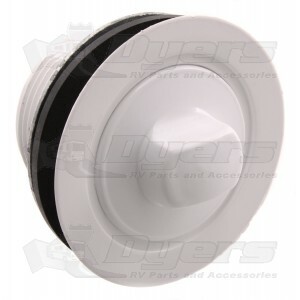 Built of plastic, it replaces any 2" drain with 1-3/4" drain hole and comes with a new screw-in plastic stopper. Inexpensive, but it worked great. I was very happy to find it at Dyers. It worked great. I was looking for a white drain plug for my whirlpool tub (not in RV). No one else had what I was looking for except Dyers. I took a chance and ordered and it is great.